Detail: Through a range of local styles, techniques, and materials, the artworks in this exhibition reveal understandings of power in Southeast Asia. Large and small objects from Cambodia, Indonesia, and Thailand are clustered to explore the powers of warfare, water, snakes, and the feminine. These themes are both culturally specific and universally resonant. During the first millennium CE, maritime Southeast Asia became a network of trading polities boasting cosmopolitan emporiums. Inland dynasties established urban capitals. Flourishing during the ninth through the fourteenth century, these cities towered with temples and supported sophisticated courtly cultures. Their rulers fostered innovative artistic and architectural creations that blended imported ideas with local traditions. Cities arose at the archaeological areas of Angkor (Cambodia), Prambanan and Majapahit (Indonesia), Bagan (Myanmar), and Si Thep (Thailand). In each place, Buddhist and Hindu schools from India gained traction. 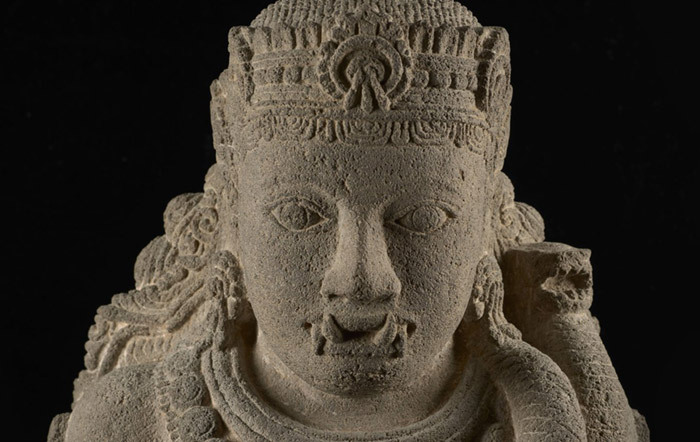 Deities including Bhairava, Agastya, and the goddess were worshiped, and potent symbols, such as water and snakes, served as markers of the divine.